Here’s the second episode of our new #AskBingAds video series! And you’ll get a chance to see me do an impression and discuss one of my favorite topics, earthquake safety. As a reminder, keep asking us product-related questions on Twitter using #AskBingAds and each month we’ll choose several to address in a new episode. If your question is selected, you’ll get one of the fabulous t-shirts you see me wearing. A huge thank you to those that submitted questions, keep them coming! Keep in mind that if you have an urgent request that requires immediate attention, please contact support. Note that the Bing Ads Blog will be on hiatus from now through next week, but we'll be back for the week leading up to New Year's Eve. Happy holidays, everyone! Feel free to ping us on Twitter -- don't forget to use the #AskBingAds hashtag for a chance for us to feature your question in a future episode (and send you a free shirt)! For general support questions, you can visit Bing Ads Answers forum. 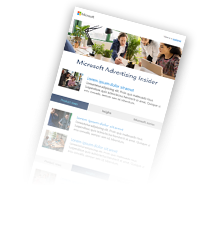 For feature requests, you can submit and vote on your top-priorities at the Bing Ads Feature Suggestion forum, or send us your feedback directly at BingAds-feedback@microsoft.com.